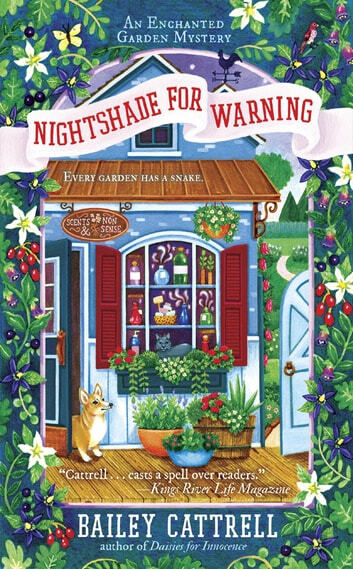 **The second Enchanted Garden Mystery from Bailey Cattrell—author of the New York Times bestselling Magical Bakery Mysteries as Bailey Cates. Elliana Allbright’s custom-made perfume shop and the Enchanted Garden behind it are garnering all sorts of attention, but a dead body could bury her in bad publicity. . . .
Ellie’s business and personal life have been flourishing in her hometown of Poppyville, California, since she opened Scents & Nonsense. She uses her very special skills to craft perfumes that almost magically ease heartache, inspire change, and bring joy—and her customers love to relax in the beautiful garden behind her shop with her corgi, Dash, and her cat, Nabokov. She even lives right next to the garden, in a compact “tiny house”—and she’s excited to hear that a journalist is going to write a feature about her home and garden for a national magazine. But then the journalist is found dead, and suspicion falls on the last person to see him—who just happens to be Ellie’s brother’s girlfriend. 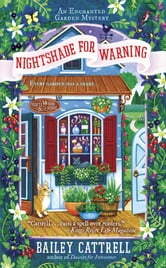 So before everything goes to seed, Ellie must rely on her powers—observational and otherwise—to pick out the real killer from an ever-expanding bouquet of culprits. . . .
A great, tightly woven story with absolutely wonderful information abount the use of plants. It is scarey how beautiful plants have hidden depths, just like people but good pervales thankfully.